Extreme Sports Houston: Is Paintball Extreme? Sometimes people refer to paintball as an extreme sport. There are times we agree with them, and other times we know that paintball is a bit too organized to fit the traditional definition of an extreme sport. 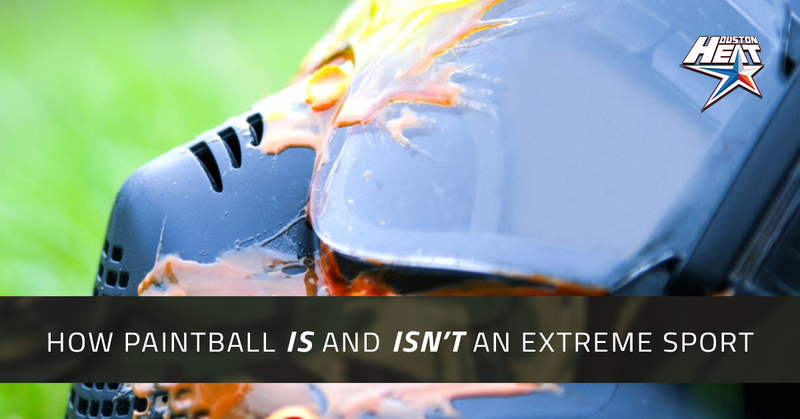 Here are some of the arguments for and against labeling professional paintball as extreme. What do you think? We have to admit that the professional paintballing that we participate in is considerably more safe than something like woodsball. In field tournament, there are judges that are going to stop the play if something goes wrong, and they’re not going to allow us to take off our goggles until everything is safe. On the other hand, woodsball can certainly be extreme. Goggles can cut down on your vision, causing people to slide down gullies or off cliffs. It’s much easier to trip over branches and rocks, and when you land on your knees it’s not soft grass or astroturf you’re falling on. There’s no doubt that woodsball is extreme. One thing that many extreme sports have in common is that they’re more likely to be sports focused on the individual. Sure, rock climbers can climb together, but in professional competitions most extreme sports are solo adventures. There’s no synchronized wakeboarding or hang gliding, no two-person street luges or tandem kitesurfing. If you’ve ever been shot with a paintball, you know why it’s sometimes called painball. Sure, the paintballs are small, but so are bullets and they certainly hurt. Both have a lot of velocity behind them, and you’re likely to end up more bruised than in many other sports. One definition of extreme sports that some people like to use is that “it’s something a college would never sanction, usually because it’s just too violent or dangerous.” If you go by that definition, then paintball can’t be an extreme sport because there are indeed college teams. Paintball is also easier to judge than many other extreme sports. Deciding whether or not someone has been eliminated from paintball is easier than judging who’s done the best powerboating. Paintball is listed as an extreme sport two separate times on the extreme sport page. While this certainly isn’t the be-all-end-all answer, enough people think it’s extreme enough to be there. So what do you think? After all of that, do you consider paintball to be an extreme sport? In the end, it doesn’t matter. We certainly love it and hope you’ll stay up-to-date with our professional paintball team.